The Heart of the Matter is Quick and Easy! | What Smells So Good? Hee hee... you knew it was only a matter of time before I stumbled on another food blogging event, didn't you? 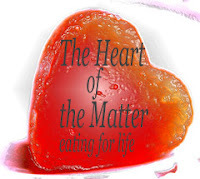 Like most of my other adored events, this one has a focus on nutritious cooking, and this Heart of the Matter roundup is no exception. less salt and sugar (HotM). Here are more tips and tricks from Joanna's Food. The twist this time is on Quick and Easy meals. For me, I like to cook and taste and cook some more, for what could easily stretch to hours (which I have done!). I do know though, that for working, busy families (like the rest of mine) fast, healthy and satisfying meals are high on the priority list most of the time. Of course, economical recipes are a bonus, and if you have everything on hand in the pantry, it means no last minute rushes out to the store! Been there, hated that. No more! This only takes 5 minutes of prep work, followed by another 25 minutes simmering together. This amazingly delicious stew is a great way to clean out the pantry, if you’re like me and wind up with way too many cans on your hands! Of course, add whatever beans or extra vegetables you'd like (frozen spinach is great), or throw some brown rice in and do away with the tuna for a hearty, vegetarian meal. For Weight Watchers, this is only 3 pts for 1 ¼ cup serving, which is plenty for hungry tree-trimmers, carolers or tobagganers coming in from the cold! Heat ¼ cup of broth in a medium pot. Add onion; sauté until tender, about 5 minutes. 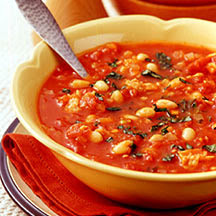 Add beans, tuna, tomatoes and oregano; stir in remaining broth and simmer for 5 minutes. Stir in salt, pepper and basil; simmer for 1 minute more. Thanks Sarah, couldn't be more perfect for this month's HotM, it looks really good! Hi Sarah - this looks great - and ingredients that are always in my cupboard. you just posted a dish I´ll cook when there´s no time or idea to muse about. And my family looooooves it!! I think so do you! !